Are you staying up to speed with your Process Safety Management (PSM) program? The Occupational Safety and Health Administration (OSHA) created the first PSM requirements in 1992 in response to a series of catastrophic incidents related to highly hazardous chemicals (HHC). These requirements have been updated and expanded several times in the last two decades, and all HHC-related companies should keep a lookout as they operate and expand. To make sure your company is compliant, keep in mind the following 14 elements that OSHA inspectors will look for when they review your PSM program. Perhaps one of the most important mandates, the employee participation clause requires that employees—including production and maintenance staff—be involved in every aspect of the PSM programs at their respective worksites. They must also be represented at the meetings where PSM-related issues are discussed. OSHA requires employee participation to be followed as written, so employers should create formal plans. According to OSHA’s PSM mandates, “The employer shall complete a compilation of written process safety information before conducting any process safety hazard analysis required by the standard.” In other words, all workers should be able to access and understand the technical data regarding the HHC-related risks they face on the job. There are plenty of potential chemical hazards following turnarounds and emergency shutdowns. OSHA inspectors want to see that companies have plans for keeping everyone safe as they start back up. Workers who carry out processes involving highly hazardous chemicals need to be well-trained, and their training should have been accomplished through a competent source, first-party or otherwise. Their training also needs to be well-documented. Training management software makes it much easier to track this. Are you reviewing your safety procedures every time a worksite starts back up? You should be. OSHA expects employers to perform pre-startup safety reviews for both new and modified facilities. This rule applies even if the procedural changes only affect a single component or process. The employers or contractors conducting these inspections must not only be officially trained, their testing procedures must follow “recognized and generally accepted good engineering practices,” according to OSHA. In other words, your company must be able to explain WHY your inspectors made their decisions. Every employer needs to issue permits to employees and contractors who weld or perform other high-temperature work near covered processes. They also need to train their personnel to post and file these permits when necessary. The technical basis for the change. The impact of the change on worker safety and health. Necessary modifications to operating procedures. The necessary time period for the change. OSHA’s state standard calls for investigations for all incidents that result in—or could have resulted in—a catastrophic highly hazardous chemical release. Because of that ambiguous wording, cautious companies must keep every potential HHC-related scenario in mind. 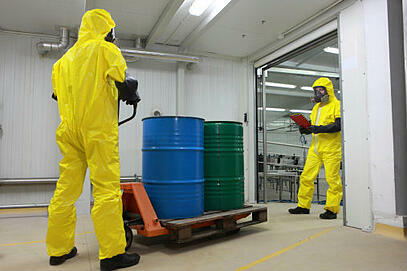 Even minor chemical releases can lead to major incidents. This element mandates employers to create emergency plans for handling smaller HHC releases. According to the PSM-NEP, “Employers shall certify that they have evaluated compliance with the provisions of this section at least every three years to verify that the procedures and practices developed under the standard are adequate and are being followed.” This element also requires employers to retain at least their two most recent audit reports. Until recently, some companies attempted to protect proprietary information by keeping process details from their employees. To prevent this scenario and enhance worker safety, the “trade secrets” element gives employees the right to know processes that may affect their health and safety. Having trouble keeping track of all of these requirements? BasicSafe offers PSM software that provides one safe location for all of your PSM documents. For more information about these easy-to-use tools, contact us today!